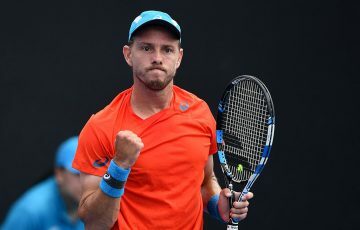 No.5 seed Ben Mitchell recovered from the loss of the first set to record a four-set win over Adam Feeney and move into the AO Play-off semis, writes James Bett. 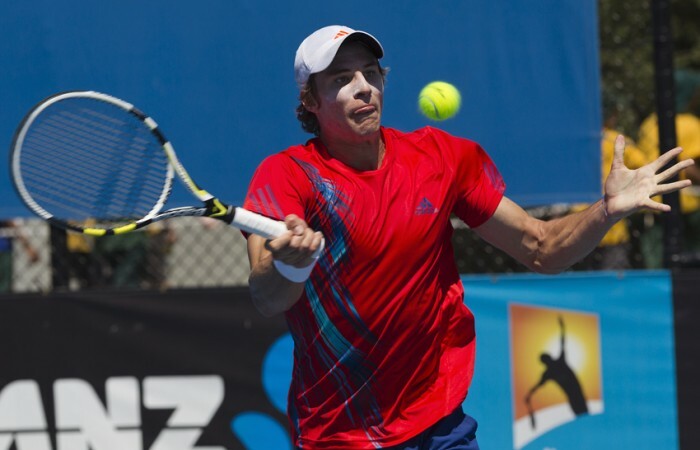 Number five seed Ben Mitchell was the first man into the semifinals of the Australian Open 2013 Play-off today with a 3-6 6-2 7-5 6-0 win over fourth seed Adam Feeney of New South Wales. In warm conditions, Feeney won the toss and elected to serve. Games stayed on serve early, as the number four seed started aggressively, his forehand particularly destructive as he pounced on any short balls. Mitchell tried his best to counter this by attacking the backhand of Feeney, but he was patient, slicing the ball in deep and waiting for his opportunity to run around and attack with his forehand. Feeney’s first break point chance came in the sixth game, but he was denied, Mitchell serving very well deep and wide into the ad court. A second break point in the same game gave the New South Welshman the break, as Mitchell netted a loose forehand, giving Feeney a 4-2 lead. In the following game Mitchell made another simple forehand-unforced error at 15-30 that levelled the score at 30-30. Feeney won the next two points to secure his break and take a 5-2 lead, the story of the first set, Mitchell missing his chances, Feeney taking his. With Feeney serving for the set at 30-15, Mitchell came up with a brilliant crosscourt forehand from beyond the baseline as Feeney approached the net. At 30-30 it seemed there was still something left, but as was the case for the first set for Mitchell, two unforced errors, one on the backhand and one on the forehand side gave Feeney the first set 6-3. Again in the second set games were on serve early, but in the fourth game of the second set Feeney started to look under pressure on his serve for the first time in the match, conceding two break points, neither of which were converted by Mitchell, before holding serve to lock it up at 2-2. In the sixth game, however, Mitchell took his chance. When presented with a break point opportunity he struck to skip away to a 4-2 lead, being more proactive on this break point than he had been in his previous two chances, which brought the error from his opponent. Feeney’s woes continued in the eighth game, with scores locked at 30-30 his second serve clipped the tape and went long, giving Mitchell a set point. Mitchell was beginning to control the tempo of the match, taking the set 6-2, and Feeney had conceded break points in three of the four games he served in the second set. As was the case in the previous two sets, the first three games stayed on serve, but in the fourth game Feeney’s problems continued on serve, and a double fault at 0-30 gave Mitchell three break points. He only needed one, a Feeney forehand that flew long was enough to secure the break. When Mitchell held his serve to love to make it 4-1, all momentum seemed to be with him. Facing two break points in the next game, Feeney’s chances seemed to be slipping away from him at a rapid rate. However, he staved off both break point chances to hold serve and then break Mitchell to love in the following game to bring the set back on serve at 4-3. When he held serve in the eighth game, the number four seed had won three games in a row and just as quickly as he had appeared to lose momentum, he had wrestled it back. Feeney had Mitchell on the ropes when he broke him again to take his lead to 5-4 and serving for the set. 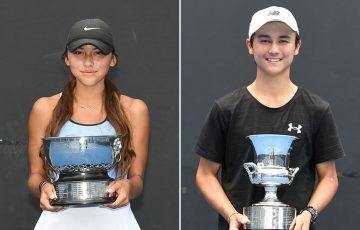 Mitchell received a court violation from the chair umpire for court abuse when he hit a ball out of the stadium after double faulting to give Feeney three break points. Serving for the set, Feeney was noticeably tight, double faulting three times, including consecutive double faults to take him from set point to break point. Mitchell took his opportunity; breaking the 27-year-old and ending his run of four games on the trot, the set back on serve at 5-5. Mitchell then held serve and we looked certain to be headed for a tiebreak when Feeney led 40-15 at 5-6, but an unforced error and then a great passing shot from Mitchell took the score to deuce, where Mitchell was able to win the next two points to take the set 7-5 and take a crucial two sets to one advantage. The fourth set didn’t follow the trend in the previous three, and when Mitchell broke Feeney in the second game, his serve become a major concern, double faulting to concede break point and then an unforced error giving Mitchell the game and a 2-0 lead. When Feeney pulled up limp halfway through the third game with hamstring soreness, it was the straw that broke the camel’s back. His movement was severely restricted, leaving him to try and blast winners from the baseline. He didn’t win another game for the match; the final set taking all of 17 minutes as Mitchell wrapped up his three sets to one victory 6-0 in the fourth. 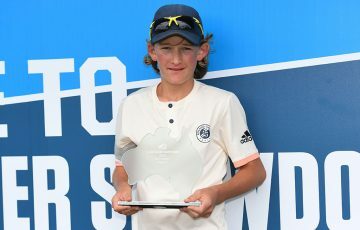 Overall though, Mitchell was thrilled to be through to the semifinals, where he will face eighth seed Matthew Barton (NSW) for a spot in the final and the chance to secure an Australian Open wildcard.